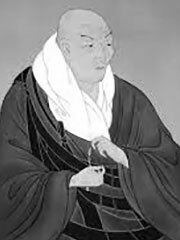 Shinran Shonin (親鸞聖人) (1173-1262) was a pupil of Honen and the founder of the Jodo Shinshu (or True Pure Land) sect in Japan. He was born at the close of the Heian period, when political power was passing from the imperial court into the hands of warrior clans. It was during this era when the old order was crumbling, however, that Japanese Buddhism, which had been declining into formalism for several centuries, underwent intense renewal, giving birth to new paths to enlightenment and spreading to every level of society. Confronting the religious hegemony of his time, Shinran re-interpreted Pure Land teaching as the supreme expression and representation of the truth of Buddhism. Essentially Shinran said that since we are all defiled by greed, hatred and delusion, we have no chance of gaining enlightenment by ourselves. Many Buddhists at that time felt that the Dharma of the Buddha had declined to such a point that people could not do it themselves anymore, a concept called mappo in Japanese. Instead the Pure Land School of Buddhism encouraged its practitioners to rely on the vow of the Buddha Amitabha (Sanskrit, Amida in Japanese) to save all beings from suffering. According to three particular sutras Amitabha vowed to ensure that anyone who chanted his name would be reborn in his Pure Land of Sukhavati (Sanskrit, lit. Happy Land) and once there would easily be able to gain enlightenmnent, because they would not be hindered by all the problems of day to day life. Shinran’s innovation in Pure Land Buddhism was to take this teaching to its logical extreme. He taught that awakening to the saving grace of Amida Buddha is the central matter. Continuous chanting of the nembutsu “Namu Amida Butsu” (Japanese, 南無阿弥陀仏), or “I take refuge in the Amida Buddha”, is not necessary, as Honen, his mentor, had believed. Through faith in the Amida Buddha arises a deep spiritual awakening, called shinjin, which severs the practitioner forever from birth and death. The advantage of the Path can be experienced here and now. The arising of shinjin also assures the devotee of birth in the Pure Land, and the attainment of enlightenment there. In another departure from Honen, Shinran taught his followers that the nembutsu should be said as a form of gratitude rather than a way of achieving entry in the Pure Land. Another aspect of Shinran’s doctrine was the emphasis on «dependence on others». Shinran believed that we exist as we do because of the many deeds of others. As such, Shinran taught that it was important to be humble and thankful to these other people. This gratitude could be expressed through the nembutsu, but also through a general sense of gratitude.